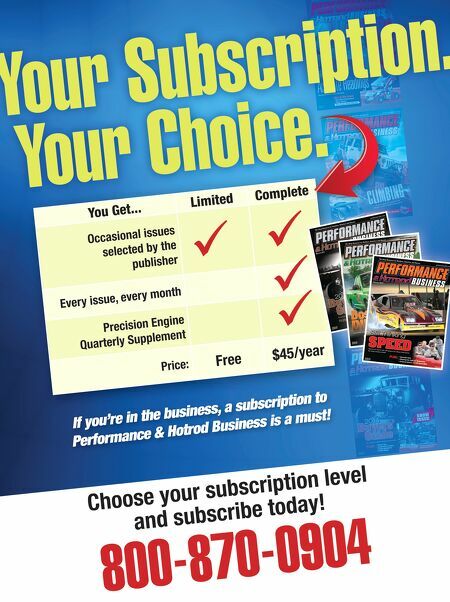 48 n Performance & Hotrod Business n January 2015 PERFORMANCE I hear many make the claim in our indus- try. Who's the most important? Who's the fastest or who's the best puller? I can tell you that diesel motorsports has been going strong since 2001 and there have been a lot of people who have come, gone and remain within the sport. Overall it is the power of everyone combined that makes the diesel industry strong throughout the country. Like any performance motorsports there are a few with egos and attitudes— that seems to go with the territory in any motorsport. But 95 percent of the every- day diesel manufacturers, shop owners, competitors and fans are just normal working people who love doing what they consider a sport. Many work in the industry to make a living, but still enjoy the work they perform daily and carry that into the weekend at events either as a fan or a competitor. You'll find the demographic for this crowd to be mostly rural people with a heavy emphasis on young people. This will give the shops something to think about when they advertise or look for new busi- ness in the diesel markets. Paving the Way There have been a lot of diesel per- formance enhancements since 2001. The high-end modified trucks went from 1,000 hp to over 2,000 hp. Street trucks went from 450 hp to over 800 hp. Most levels more than doubled and they continue to grow every year. To help in distinguishing those who have contributed in the past, DIESEL Motorsports developed a "Hall of Fame" three years ago. It's designed to honor those people who helped build the busi- ness and contributed either with products, services or as a competitor. 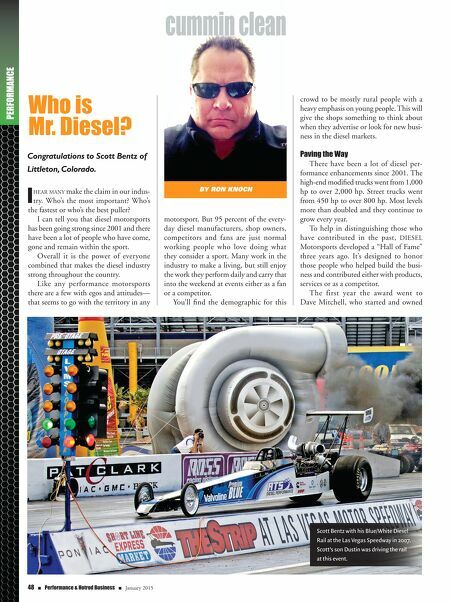 The first year the award went to Dave Mitchell, who started and owned By Ron Knoch Who is Mr. Diesel? Congratulations to Scott Bentz of Littleton, Colorado. Scott Bentz with his Blue/White Diesel Rail at the Las Vegas Speedway in 2007. Scott's son Dustin was driving the rail at this event.